What’s going on in the water treatment plant? You are here: Home / Editorial / What’s going on in the water treatment plant? In my 20-plus years working with drinking water treatment plants as an engineer with the Kentucky Division of Water Drinking Water Program, I have seen a broad range of commitment by public utilities in producing drinking water for public consumption. Many people are unaware of where their drinking water even comes from. I have to smile as I recall instances of asking for directions to a drinking water facility, only to arrive at the local sewage treatment plant. The drinking water treatment plant supplying water to the residents of the City of Irvine and Estill County is among the top utilities committed to providing a quality product in high quantity at a low price. This success is due in part to the training and improvements the treatment professionals pursue through the Area Wide Optimization Program conducted by the DOW Drinking Water Program. This voluntary federal program promotes improved water quality at little or no cost to the utility. The initial emphasis of AWOP was to promote enhanced particulate removal through the treatment process, encouraging the adoption of settled and filtered water goals that have been scientifically proven to provide safer water than the regulations require. Utilities that buy in to the program benefit from better process control and operation staffs tend to take more pride in their finished product knowing that they are providing the best water they can for their neighbors and families. The Irvine WTP has been an optimized facility in three of the last four years. To put this in perspective, there are 152 surface water treatment plants in Kentucky, but the greatest number of optimized plants in any given year has been 32. Few plants are optimized year after year because of the stringent requirements. Compliance with turbidity requirements (finished water clarity) has always been achieved by Irvine since adopting optimization standards–a fact that should be appreciated by the consuming public. 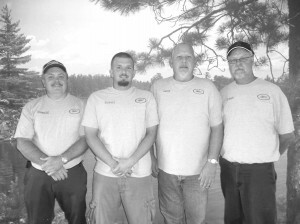 Irvine Municipal Utlilites water treatment plant employees are, from left, Donald Keith Noble, Robert Stepp, Larry Stewart and Lonnie Gross. These men operate the plant that sends clean water to the IMU customers in Irvine and Ravenna. They are required to perform 70 to 80 tests a day on the water and add chemicals as needed. They have the lowest disinfectant biproduct numbers in the state. Each man is highly trained and has to work under a trained professional for two years before he becomes certified. IMU Project Manager Bee Williams said he is very proud of the job they do. Drinking water regulations change as federal EPA requirements dictate performance of water systems. Since I have been working in the program, turbidity limits have changed three times–getting lower with each change. It only makes sense that clearer finished water is safer and more desirable. There are numerous parameters of drinking water that must be analyzed and there are contaminant limits set in place to ensure that the water is safe for consumption. The optimization program has expanded its training to include treatment-plant-based disinfection byproducts (DBPs). These byproducts are a direct result of total organic carbon (TOC) reacting with elemental chlorine, the residence time within the distribution system and water temperature. If you live in Estill County, you may remember receiving a letter in early 2009 stating that the plant had exceeded the maximum contaminant level for these byproducts. Subsequently, Irvine was selected by the technical assistance program to be one of six plants participating in DBP training and I was given the task of being the training facilitator for them. On my first visit to the treatment plant, the operators were actually stuffing those notifications letters into envelopes to be mailed to the customer base. It seemed like this training could be a real benefit to Irvine. While management and staff agreed about the benefits of the training, they expressed some concerns that changes in the treatment process could have a negative impact on the microbial end of treatment. In other words, they wanted to lower their byproduct numbers while maintaining their optimization status. After some discussion, management and staff agreed to participate, so the wheels were set in motion to make an effort to improve the potable water quality as it relates to disinfection byproducts. The training began in December of 2008 with a kick-off meeting in Williamstown, where all six systems were exposed to the goal of reducing treatment-plant-based DBPs. Compliance for DBPs is determined by sampling in the distribution system, but the thought process behind the training is to lower the treatment-plant-based formation in hopes that the levels in the distribution system would lower as well. The training consisted of six sessions at various locations spread out over a 15-month period. Initially, all six systems were asked to populate computer spreadsheets to reflect operation and provide baseline data to help gauge the effects of any treatment changes and to indicate whether these changes could actually be implemented. Ten months into the training, systems were ready to implement changes. In Irvine, the change was to move the point of initial chlorination from the beginning of the process to immediately prior to the filters. This change required some modification of the chlorination system to help ensure safety of the operations staff. This contractor cost, along with the purchase of a spectrophotometer, was the investment needed to successfully participate in training. Moving the point of chlorination required the use of an alternative oxidant to lower TOC numbers prior to the addition of chlorine. Once this was put in place, improvement in lower DBP numbers (measured in parts per million) was immediate. The training also required the staff to perform reduced scale jar testing (incremental dosing of six two-liter jars) to find the best dosage for TOC removal. With the use of a TOC analyzer at the City of Richmond’s facility, another training participant, the Irvine staff could assess the best coagulant dosage for TOC removal. The jars revealed that the coagulant dosage used could be lowered without sacrificing microbial or DBP performance. Lower coagulant doses led to higher savings. With the official training over, I can say it has been my pleasure to work with the staff and management of irvine. I was continually impressed by their dedication to provide the best product possible to the consuming public. I look forward to a December meeting of personnel with the six plants to share results of this new way of thinking about water treatment and its implementation. While you may not know where the water treatment plant is or how drinking water really winds up at your house, consider yourself lucky that your treatment professionals consider your health important. Next time you see a member of the plant staff, give them a big thank you.